Tongue Biting Good – Photojimsf!!! Yesssssssss! Thai green papaya salad made just the way I like it, no chilies, just a little garlic. This at my favorite cheap cheap eatery in Jomtien Beach, Thailand. 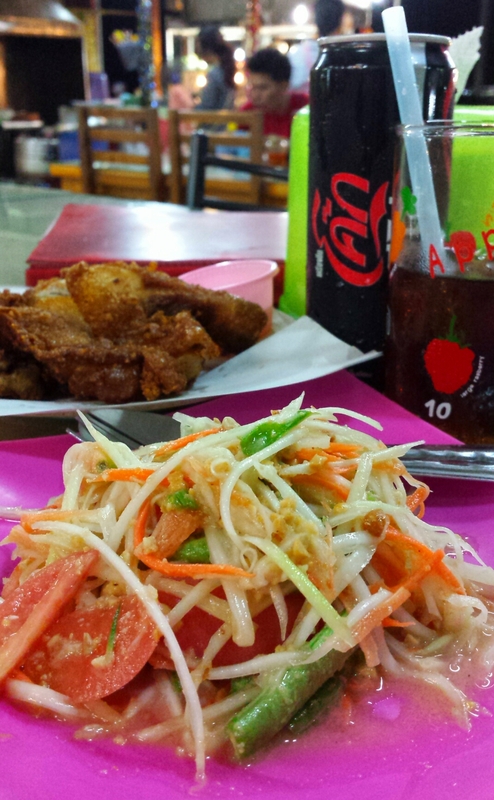 Ran Nong Som, a family-run establishment right on the beach road has good quality food at very reasonable prices. (it’s on Jomtien Beach Road just past Soi 3 but way before soy 4). Along with the salad, I had a huge piece of fried chicken thigh, and a Coke Zero with ice. Would that be considered a paleo diet? I was so enjoying it, but distracted, that I bit my tongue, for the second time today. Fortunately I did not break the skin this time. But I did earlier this afternoon while I was on the beach gossiping with my buddy Paul about financial woes of the global economy. When something bothers me, I google it and see if I can find relief. I read there’s a superstition that says when you bite your tongue, it means the next thing you were about to say is a lie. That doesn’t describe me at all, paragon of virtue that I am. Okay, rarely, I might embellish a story just a teeny tiny little bit. Continuing my Google quest, I found all kinds of hypochondriac causes, such as antidepressant medications, seizures, obsessive compulsive disorders, anxiety, stress, bruxism, and more. Treatments involved psychotherapies, habit retraining, orthodontics, even surgery. Towards the end of the research, I decided it was merely not being mindful while eating, saltwater rinsing all that’s needed. Thankfully the pain is gone, and I truly enjoyed my healthy, or relatively healthy for me, meal at my favorite eatery in Jomtien beach. Stay tuned for more of Jimbo’z fairy tales from afar, including a lurid story about breaking in a new foreigner in town at Boyztown.